You might have heard the word mitt used when talking about baseball. 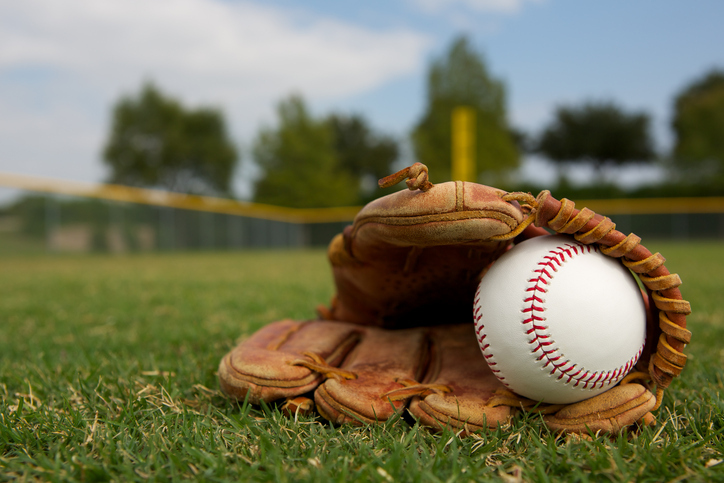 A mitt is a rounded, thickly padded glove used by all baseball fielders. A glove that leaves the ends of the fingers bare is also a mitt and mitt can also sometimes be short for mitten, a glove that doesn’t separate the fingers, but just has one part for the thumb and one for the fingers. In US English, any other similar padded glove used for a particular purpose, like to avoid getting burned while touching hot surfaces, is a mitt as well. As a slang term, mitt can mean hand. The catcher put on her mitt. Steve's fingers were peeping out of his mitts. The children put on their coats and mitts to go and play in the snow. Sabina used an oven mitt to take the cake out of the oven. Get your mitts off my things! Mitt dates back to the mid-18th century. It is a shortened form of mitten. Mitt has been used as slang for hand since the late 19th century, and to describe a glove used in baseball since the early 20th century. Mitten dates back to the late 14th century. It came into English from the Middle French mitaine (half glove or mitten) and the Old French mite (mitten). It can be traced back to the Medieval Latin mitta, though its origin before then is uncertain. Mitta may have come from the Vulgar Latin medietana (divided in the middle) or from the Middle High German mittemo and the Old High German mittamo (middle or midmost). Both of these possible origins, however, came from the Latin medius (‘in the middle, between or from the middle,’ as well as simply ‘the middle’) and the Proto-Indo-European root medhyo– (middle). It is related to the Sanskrit madhyah and Avestan madiya– (middle), the Greek mesos (in the middle, between or from the middle), the Gothic midjis and the Old English midd (middle), the Old Church Slavonic medzu (between) and the Armenian mej (middle), as well as many modern words with similar meanings, such as the Spanish medio, mitad, the French milieu and moyen, the Portuguese meio and médio, the German Mitte, and English words such as amid, mean, medal, median, medieval, mediocre, Mediterranean, middle, midriff and midwife.